hello again! today i thought i'll share some of the online classes i have signed up most recently! the first is a mini book workshop by maggie holmes! life is full of celebrations, whether big or small, and it's all worth documenting. in this class, maggie holmes shares her method for creating eclectic, tag-style mini albums that pack big-time style and design. go beyond the basics by learning how to incorporate pockets, envelopes, custom-size page protectors, and more. join maggie, and be inspired to celebrate your life in fabulous and creative new ways! the class has already started (since 10th jun) so once you sign up, you are ready to go! to sign up or find out more about this class, click here. the registration for this class is ending 30th Jun so here's your last chance! oh yes, and you might also want to check out the cutest kit maggie used for her album here! 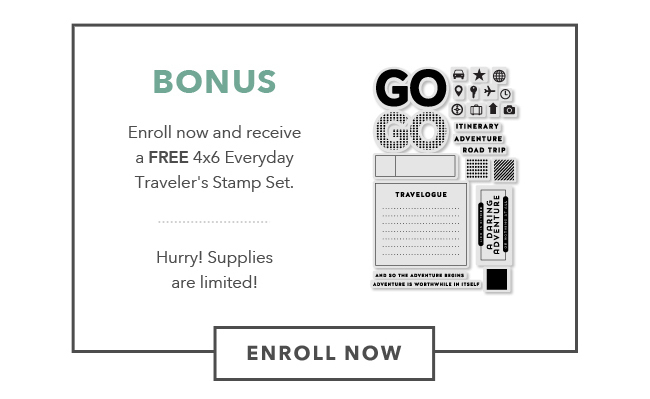 the second class i'm going to share is everyday traveler! planners and traveler's notebooks are what everyone's talking about now! it just seems so fun to be using all the scrapbook materials, not just in creating layouts, albums or cards but also to plan your daily activities and organise your life! i have been trying my best to resist the temptation of joining this trend but i gave in... once this class and the beautiful traveler notebooks (i bought this one :))were released on studio calico! here are the details of this class! every day is a new adventure! join waisam ho (aka happie scrappie) to discover how to record your daily journey using a traveler’s notebook. in this class, she proves that travel notebooks aren’t just for explorers and will share tips and techniques for creating one that fits your lifestyle. from art journals to planners, waisam will teach you how to document everyday moments in a stylish and creative way. you will also be happy to know that while stocks last, all students will receive a bonus 4x6in stamp set from hello forever. this stamp will ship for free, no matter where you are! class will start on 6th july and registration will close on 1st july! to sign up or find out more about this class, click here. you might also like check out the awesome class supplies that studio calico has put together. thank you so much for dropping by. have a good week ahead and see you in class!